The day after the wedding (30th Dec) is all a bit of a blur now and it makes me wish I had written this post sooner! We travelled in the evening and I don’t think I’ll ever forget the cold wind I felt when getting off the plan at Edinburgh Airport! They’re not kidding when they say Scotland is chilly! After a very long sleep, We woke up and it was New Year’s Eve! We didn’t have too much planned apart from a very special restaurant reservation! Josh and I didn’t really feel like joining the street party as it was extremely busy and we were still really worn out (who knew weddings could be so tiring?!) – all I wanted to see were some sparkly fireworks which luckily we could see from our B&B window! If anyone saw the Edinburgh fireworks or saw them on TV you’ll know they were massive – I’m pretty sure the whole of Edinburgh could see them! 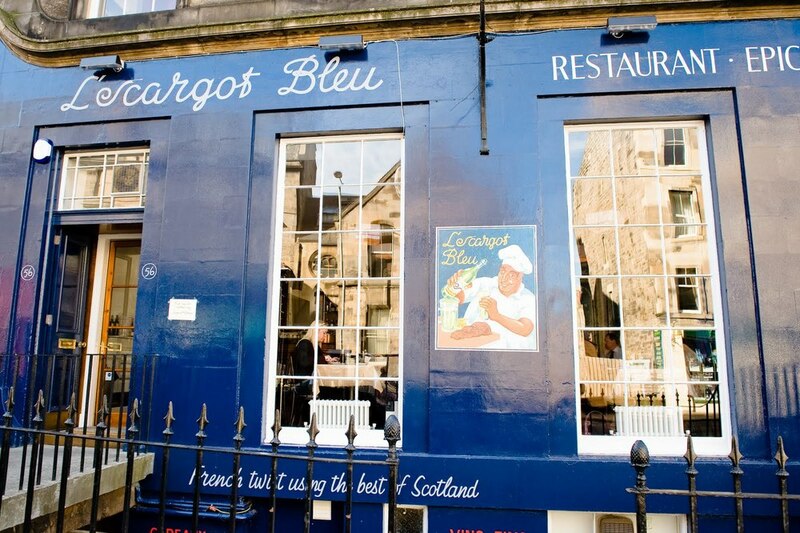 Our special reservation was at a little restaurant called “L’escargot bleu”. All I knew before going was that our reservation was at 8:30pm and included a set menu 3 course meal. Unfortunately I did not get a copy of the set menu but I can tell you what Josh and I enjoyed for our meal! Apologise for the slightly blurred photos – the atmosphere was romantic with twinkling lights and the tables quite close together – I’m far too easily embarrassed to use the flash in a situation like that! For starters Josh and I had the same thing. Camembert is a firm favorite of ours. It’s a fairly strong in cheesy flavor (stronger than brie but well away from blue cheese!) and when it melts it turns into a oozy, cheesy, velvety pile of deliciousness. 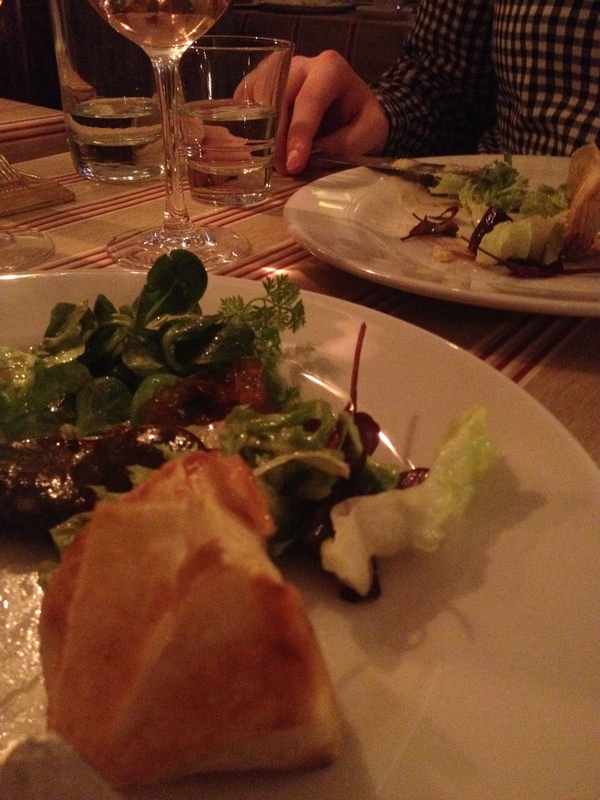 These particular chunks of my favorite cheese were wrapped in delicate filo pastry, baked into submission and served with caramelized onion and a small salad. It was definitely a winner with this pair of cheese lovers. 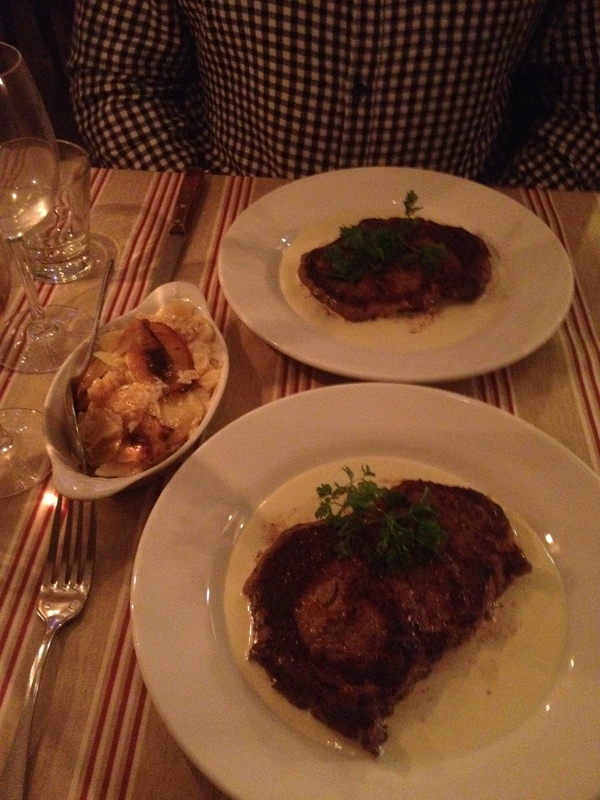 For our main course we decided on entrecôte – or very nice steak to you and me! I never know how to ask for a steak in restaurants, I like it a little bit pink still so at home I would refer to it as medium-rare. But when eating out I usually ask for it medium as nothing puts me off steak more than seeing it “juices” still flowing. But I shouldn’t have worried in this case – the steak was cooked perfectly just how I like it! It even came with it’s own pool of blue cheese sauce and it’s own side dish of potato dauphinoise (potato baked in cream and nutmeg with a sprinkle of cheese on top). I think the dairy may have got a bit much for Josh at this point – and he’s not the biggest fan of blue cheese – but he still enjoyed it! I, on the other hand, have no problem with too-much-cheese-syndrome and earned the name “Queen of Cheese”. Joshua had a slice of chocolate torte with a creme anglais. I had a beautiful creme brûlée. 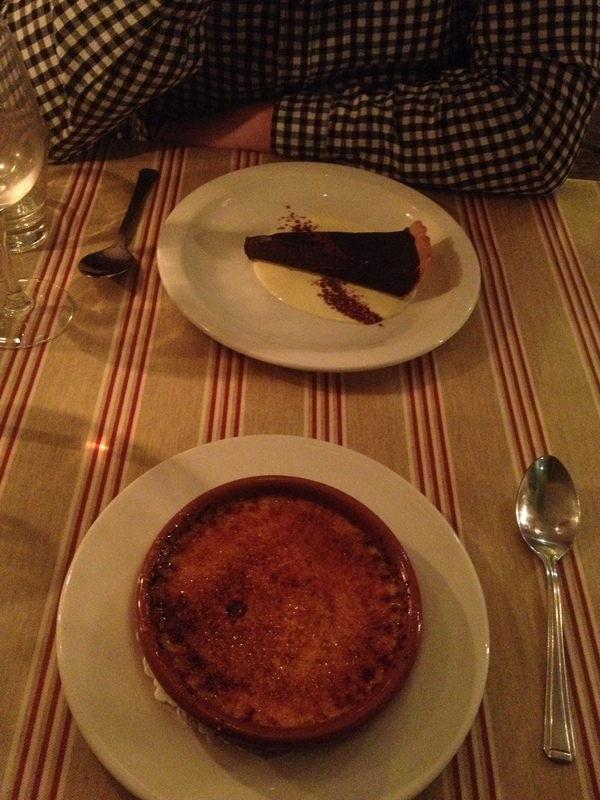 I can’t speak for Josh’s torte but I really enjoyed my creme brûlée. The creamy part can sometimes be too sweet but this wasn’t too rich or sweet – a perfect partner for the crackly sugar on top. It was a brilliant meal and the service was excellent. It was a great way to spend NYE together before watching those fireworks!